Micromechanical exfoliation remains the best method in terms of electrical and structural quality of the obtained graphene, primarily because it benefits from the high-quality of the starting single crystalline graphite source. It has been known since the early 1970s that graphene could be grown directly on solid substrates and two different mechanisms can be exploited: the thermal decomposition of carbides or the epitaxial growth of graphene on metallic or metal carbide substrates by chemical vapor deposition of hydrocarbons. The thermal treatment of silicon carbide at about 1300 C under vacuum results in the sublimation of the silicon atoms while the carbon-enriched surface undergoes reorganization and, for high enough temperatures, graphitization. The careful control of the sublimation has recently led to the formation of very thin graphene coatings over the entire surface of SiC wafers, with occasionally only one graphene layer being present. Growth of few-layer graphene on Ni films, by CVD at atmospheric pressure is reported. Graphene is a zero gap semiconductor, so that a field effect transistor (FET) will not have an ‘‘off’’ state unless a forbidden gap is created. Such a gap can be produced confining the electronic wave functions by etching narrow graphene nanoribbons (GNRs) typically of a few nanometers in width and with well defined crystallographic orientation. So GNRs are 1D while Graphene layer is a 2D allotrop of carbon. A suitable lithographic technique will allow the patterning of the ultimate, one atom thick nanoelectronics, that can operate initially most likely in combination with semiconductor- based circuitry, but with the potential that shortly graphene-only circuitry will become possible. To make possible the exploitation of the advantages arising from the possibility of lithographic patterning, two conditions have to be fulfilled: (i) the width of the GNRs has to be controlled down to a few nanometers in order to be able to achieve gap values that will allow room temperature operation; (ii) the crystallographic orientation of the GNRs has to be controlled equally precisely as a misorientation of only a few degrees can completely ruin the gap. Carbon is the fourth most abundant element in the universe after hydrogen, helium, and oxygen. After the Second World War, in the middle of the last century, further tremendous progress in the science of carbon has lead to unexpected and fascinating discoveries. from another atom. Carbon can form three different kinds of bonds that involve the sharing of electrons. These are called single, double, and triple bonds, depending on how many pairs of electrons are being shared with another atom. This can be another carbon atom, or it can be an atom of another element. In a single bond, two atoms share one pair of electrons. In this electron pair, both electrons can come from one atom or each atom can donate an electron. In a double bond, two atoms share two pairs of electrons. In a triple bond, two atoms share three pairs of electrons. Some elements have several different forms. These different forms of an element are called allotropes. Fullerenes are molecules where carbon atoms are arranged spherically, and hence, from the physical point of view, are zero dimensional objects with discrete energy states. Carbon nanotubes are obtained by rolling graphene along a given direction and reconnecting the carbon bonds. Hence carbon nanotubes have only hexagons and can be thought of as one-dimensional _1D_ objects. Graphene A graphene crystal is an infinite two-dimensional layer consisting of sp2 hybridized carbon atoms , which belongs to one of the five 2D Bravais lattices called the hexagonal (triangular) lattice. 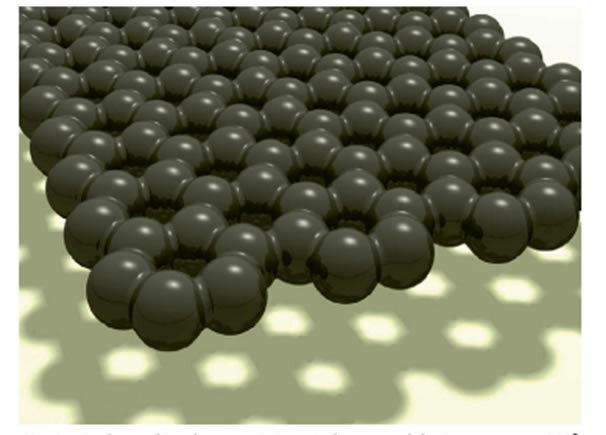 It is noteworthy that by piling up graphene layers, in an ordered way, one can form 3D graphite. Graphene was initially considered as a theoretical building block used to describe the graphite crystal, and to study the formation of carbon nanotubes (rolled graphene sheets), and predict their fascinating electronic properties. This 2D atomic (one atom thick) crystal of carbon has as fingerprint a unique electronic structure with linear dispersion close to the Fermi level. Charge carriers in graphene are better described as massless Dirac fermions, which result in new phenomena. Graphite, a three dimensional _3D_ allotrope of carbon, became widely known after the invention of the pencil in 1564, and its usefulness as an instrument for writing comes from the fact that graphite is made out of stacks of graphene layers that are weakly coupled by van der Waals forces. We can define graphite as an infinite three-dimensional crystal made of stacked layers consisting of sp2 hybridized carbon atoms ; each carbon atom is connected to other three making an angle of 120◦ with a bond length of 1.42 Å. Depending on the layers stacking, these crystals could be hexagonal (ABABAB. . .) or rhombohedral (ABCABC. . .). In both 3D crystals, the layers interact weakly through van der Waals forces. Graphite crystals can be found naturally, and can also be artificially synthesized by thermolytic processes; such as the production of highly oriented pyrolytic graphite (HOPG). Having the title of the strongest material ever measured3, graphene is a two-dimensional (one-atom-thickness) allotrope of carbon with a planar honeycomb lattice . It is regarded as the basic building block of carbon nanotubes and large fullerenes. The properties of carbon nanotubes originate from graphene sheets. With the exception of diamond, it is possible to think of fullerenes, nanotubes and graphite as different structures built from the same hexagonal array of sp2 carbon atoms, namely graphene. Indeed, fullerenes and nanotubes can be mentally visualized as a graphene sheet rolled into a spherical and cylindrical shape, respectively, and graphite can be described as a stack of alternately shifted graphene sheets. The infinite plane of a perfect graphene shows a zero electronic band gap with electrons having zero effective mass where valance and conduction bands meet4. This makes graphene an anomalous material, which does not behave as either a metal or a semiconductor. Graphene exhibits a number of exotic physical properties, previously not observed at the nanoscale. The observation of room-temperature quantum Hall Effect, ultrahigh electron mobility and ballistic transport, long electron mean free paths, superior thermal conductivity, great mechanical strength, and remarkable flexibility are among the striking properties of graphene. Hence, its desirability in electronics. Graphene has first attracted the curiosity of mesoscopic physicists owing to its peculiar electronic behavior under magnetic field and at low temperature. The investigation and tailoring of its transport properties from macroscopic to molecular scales captures a large share of the current research effort. Technologists and materials scientists have rapidly grabbed some of the assets of graphene and are already exploring the ways of incorporating graphene into applied devices and materials. Eventually, chemists and surface physicists remembered their ancient recipes which could provide solutions to mass produce the elusive carbon monolayer either in bulk suspensions or in substrate-supported forms. Now, graphene is a new and hot research topic with a strong vow to address the global demand for a new revolutionary material. 1. West, K., Carbon Chemistry. 2008: Infobase Publishing. applications. Lecture notes in physics; ; 677. 2006, Berlin ; New York: Springer. xvi, 552 p.